Summary: Let me set the record straight. My name is Charlotte Silver and I'm not one of those paranormal-obsessed freaks you see on TV…no, those would be my parents, who have their own ghost-hunting reality show. And while I'm usually roped into the behind-the-scenes work, it turns out that I haven't gone unnoticed. Something happened on my parents' research trip in Charleston—and now I'm being stalked by some truly frightening other beings. Trying to fit into a new school and keeping my parents' creepy occupation a secret from my friends—and potential boyfriends—is hard enough without having angry spirits whispering in my ear. All I ever wanted was to be normal, but with ghosts of my past and present colliding, now I just want to make it out of high school alive…. My Thoughts: I had waited a few months to read Past Midnight after its official release date. Why? I have no flipping clue! This book was really good! We are introduced to Charlotte and her weird family. First there is her parents who are basically ghost hunters and have their own television show. Next there is her sister Annalise who Charlotte is always comparing herself too. They run their own ghost show parading around the country trying to get ghosts or energy in action and that makes Charlotte one weird girl to others. Charlotte and her parents spend the summer near her sister's college and a weird energy attaches itself to Charlotte and follows her to their next home. Her parents have been forced into staying in the same place for a year because Annalise wants them to. Charlotte finally gets to have friends! Yay! She meets a cheerleader named Avery and becomes friends with her. But of course her friend is hiding secrets and Charlotte kind of gets dragged into them. She needs to find a solution to solve all the problems surrounding her new friends, the mystery between Jared, her secret crush on Noah, her new ghosts, and how to keep her family's jobs a secret (yeah right)! Charlotte just needs a good night's sleep (how do you get one of those when you have ghosts stalking you?) and have a stress free day! This book is just over 200 pages so I won't say much else! If you like ghost stories you'll probably enjoy this. I'm more of a romantic and there wasn't a whole lot of romance in it but I'm hoping things heat up between Noah and Charlotte in the next book! 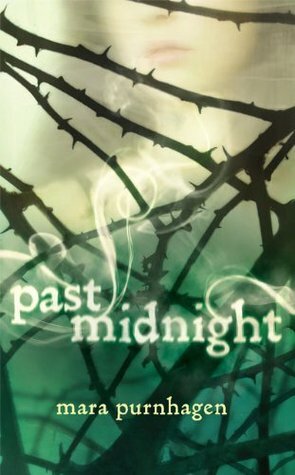 Overall: I really enjoyed reading Past Midnight! I can't wait to read One Hundred Candles! I'm very excited for it! Cover: Its kind of a creepy cover. Its hard to tell there is an actual person on it, and I'm not a big fan of green but its a relevant cover. Ooh, I've seen this around. I added it to my Goodreads not too long ago and I think I kind of forgot that it was on there. I have way too many books on there. Thanks for bringing it back onto my radar. :) Your review is lovely and makes me want to read it even more now. I'm glad you liked it. :) And I never noticed the person on the cover! This sounds fabulous and I love that cover. Great review!